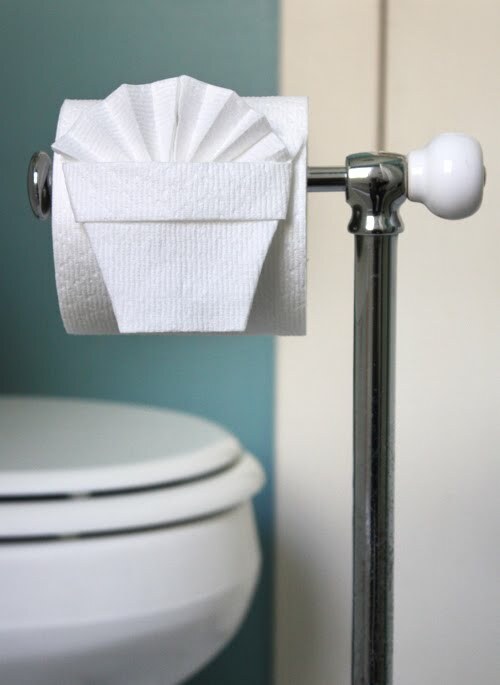 Essential life skill #2: folding toilet paper into pleasing shapes. This might be even more essential than making paper straw wrappers into flowers—just imagine all the joy you could spread during your countless opportunities to do this. Leave a surprise in the bathroom of your dinner party host. (No! I mean a nice surprise.) Or delight the next visitor who enters that public restroom stall. In just 60 seconds, you can make someone else's life worth living. To learn some easy toilet paper folding techniques, go here. I tried this one, above. And when you've mastered these, you can get this book. Note: my thick Cottonelle worked okay for this design, but cheap, crisp public restroom tissue would be ideal. Now go forth and beautify bathrooms everywhere. That is fun and made me laugh. "an essential life skill" indeed ;) Have a great weekend. Speaking of cheap public restroom toilet paper...how cool would it be to leave the toilet paper like that in a public restroom for the next person.... or maybe not! I am so trying this out! That is very cute, but I think the paper rose in the straw is more essential! One more reason why the paper has to roll over the top! And public restrooms? Definitely doing that! I can't believe there are whole books about this! This one got me giggling... but you know I'm going to have to try it out lol! Great idea, it's almost like yarn bombing isn't it, if you do that in a public restroom. Can't wait to try it!! Fantastic! I'm going to attempt this in some of the bathrooms at school. =D Some kids have started the "knit graffiti" so why not make the toilet paper pretty too? Have a great weekend! oooo, this is quite essential isn't it? I wish someone would make my life worth living. All I have is a great family and fullfilling hobbies. Where are MY TP sea shells? I'm totally doing this, if I walked into a public bathroom and saw that I would be so tickled. I would need to unravel the toilet paper and discard the already touched stuff but still. Adorable! Totally just practiced this. The cheap stuff does work! hilarious! beats reading a magazine that's for sure ;) awesome job. Now you know I HAVE to try this. This book is a must-have. Maybe everyone on my Christmas list will get it and a roll of toilet paper to go with. Ha ha - this is great! I'm envisioning toilet paper in homes and public places all over the world looking like this now! This reminds me of the resort my husband and I stayed at in Mexico a couple years ago. When we came back to the hotel room at night there was towel origami on the bed: a swan, an elephant, even a dinosaur! What a hoot! TP origami completes me. Thank you! Fanatstic - I'm always impressed in hotels when they fold the toilet roll into a triangle but this is something else! I'd feel like I was on a cruise every day! In my own home! Except for the fact that there'd be no attentive wait staff following me around. Crud. This is fun and cute and I am defenitly going to try it somewhere unexpected. just completed this one in our bathroom...cant wait for my hubby to come home...haaaaaaaaa! classic! thanks! You get this week's Silliest Post Award; thank you for the laugh! This is funny and such a great idea. Your comment about leaving a treat for the next person in the public restroom made me laugh...my sneaky mind instantly went to the long line of women waiting to use the toilet (all doing the pee pee dance). And the woman finally gets in there and is all "THIS is why I had to wait?" I'm evil. I guess it would be best to use the origami for uncrowded bathrooms instead. I certainly would like to see something so pretty since it's pretty darn scary in there otherwise. Unfortunately (and annoyingly) my office building has the rolls stuck in the underhand position. I totally love this in such a quirky "i do it for me and only me" kind of way. Thanks for sharing doll! Love this!! Tried it right away, and it's so easy, and looks great!!! Made me laugh! Thank you!! Unbelievable. You might be kidding, but I would totally do this! I'm not kidding. I left one in a public bathroom the other day. this only works if you hang your t.p. the wrong way! Truly an essential life skill! :) Thanks ! I have taught all the cleaners at work today so they can put the finishing touch to the public toilets. Have featured you on my blog tonight also. hi! i know i'm a little late to the TP life skill party, but i linked to your blog last week; hope that's ok! i love all your posts!